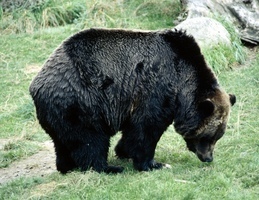 1 In the beginning of time, bears had different tails than they do today. Now they are short, but back then they were long, graceful tails with long, thick, black hair. If a bear wished to be noticed, he would wave it in the air. 2 One winter day, Old Man Bear came down to a frozen lake. There he saw the strangest sight. 3 Fox sat on the ice with his back to a hole. What was even stranger were the many fish lying on the ice around the hole. 4 Bear was hungry. He saw the fish and thought about how good they would taste. 5 As he watched, Fox twitched and flipped his bushy tail out of the water. Holding on to the end of his tail was a large fish. 6 Bear went over to talk to Fox. His eyes were wide with surprise. 7 "Good day, Fox," said Bear. "What wonderful fish! Would you teach me to catch them as you do?" 8 Fox looked up at Bear. There is nothing a fox likes doing more than playing tricks on someone. He smiled a foxy smile and spoke to Bear.